Taste test: These wide-rippled, golden yellow potato chips (one of the five varieties in Kettle's People's Choice 2007 promotion) were thick cut and very crisp, with a great kettle-cooked crunch. They had a lot of dark seasoning on them, and the jerk flavor was strong, spicy and very tasty, with a lingering hot aftertaste. 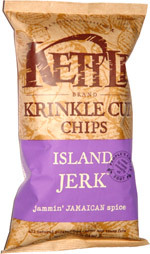 The intense flavor and mix of spices made these barbecue chips really stand out from the barbecue crowd. I wouldn't put them on the same world-class tier as Kettle's Spicy Thai flavor, but they were still quite good. Smell test: Very strong, very sharp, very sweet jerk barbecue flavor.